Never read any other blogs. 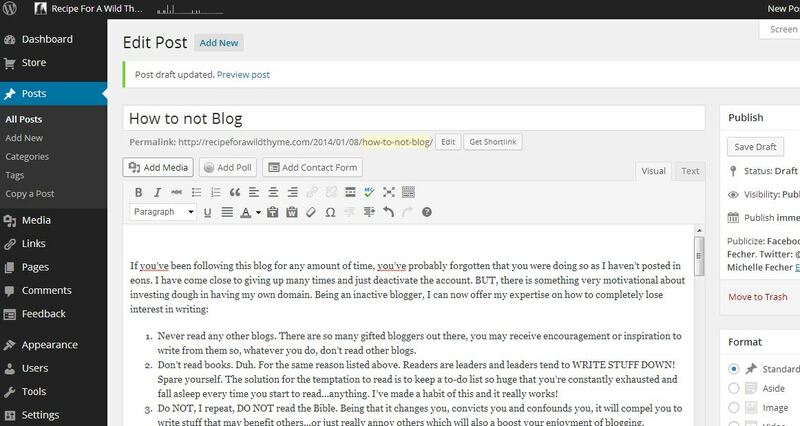 There are so many gifted bloggers out there, you may receive encouragement or inspiration to write from them so, whatever you do, don’t read other blogs. Don’t read books. Duh. For the same reason listed above. Readers are leaders and leaders tend to WRITE STUFF DOWN! Spare yourself. The solution for the temptation to read is to keep a to-do list so huge that you’re constantly exhausted and fall asleep every time you start to read…anything. I’ve made a habit of this and it really works! Do NOT, I repeat, DO NOT read the Bible. Being that it changes you, convicts you and confounds you, it will compel you to write stuff that may benefit others…or just really annoy others which will also a boost your enjoyment of blogging. Avoid contact with your children and do your best to not enjoy their company. Especially if they have changed your life for the better, are beautiful people, are geniuses, are adorable, and/or are hilarious. Do not become a foodie. The thing about foodies is that they not only enjoy food but they enjoy the effect food has on everyone else. That is why they have this compulsion to take 23 photos with commentary of the one recipe they have to share with the world because they know that the world will not be the same until at least 28% of the world’s population have tried, what they know is, the best recipe for Macaroni and Cheese. Write off writing. This is a problem if you homeschool or teach writing in any capacity because there is something contagious about writing assignments. Just reading a kid’s book report can cause an irritating itch to write something. Writing a thank you card or even a tweet has been known to trigger an irrational urge to write more. Sometimes, 140 characters are not enough. Writing anything is like practice and practice makes…well, you know. And whatever you do, DON’T read about writing! You’ll just be shooting yourself in the foot. Don’t make memories with family or friends. They are precious and you’ll want to preserve them by keeping photos and journaling. Celebrating any type of birthday or holiday would fall under this category. Turn off the radio and get rid of your I-pod. I call music “the rhythm of the soul.” It touches places within us in a way nothing else can. Of course, that would be counter-productive for one trying to shake the addiction to writing as listening to music will bring to light things from within that will move you and move others should you feel constrained to write about the things that move you. Music has access to our love, anger, sadness, joy, dance, courage, fear, betrayals, loyalties and worship that absolutely nothing else has. You know what else happens if you listen to music? You develop favoritism for types of music and the artists that God has endowed with this aggravating gift then you attend a concert or two which creates and appetite for more and a devotion and desire to show your support and an unexplainable need to take way too many photos at said concerts then you find out other fans (as well as the artists) love concert and gathering pics so you feel obligated to get them posted so others can enjoy them and, well, you can see how this can be a problem. Don’t own a business. Being a business owner just offers way too much material for writing. You meet so many interesting and amazing people, you have a plethora of problems, and have way too many adventures. You don’t need this in your life if you’re trying to stop writing. Don’t be clever. Creative people come up with all kinds of DIY projects, home improvements ideas, organization tips, etc. It’s really hard to not share ideas that someone else could use. 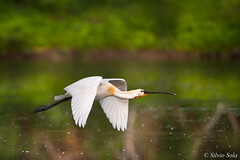 You take a pic of some brainchild you come up with, the next thing you know, you’re posting it on Facebook and someone asks how you made it which encourages a how-to blog post and the next thing you know, it’s all over Pinterest which makes you feel all warm and fuzzy and you are encouraged to post again. Subdue the urge to be artsy fartsy. There are plenty of other people out there with…shudder..ideas. Lose the camera. Just don’t get into photography. I’ve already addressed this in other areas but you’ve seen the blogs and websites. People who take pictures can’t just leave them there on the memory card. What’s not shared is lost, remember? So just stop taking pictures. Nuff said. I mentioned being tired before but I cannot emphasize enough the importance of being overcommitted and exhausted. It helps if you don’t have a regular routine that includes time to write. If you simply hope that when you sit down at the end of the day, you can jot down a few words to post before your eyes clamp shut, then you have a great formula for successful avoidance of blogging. Procrastinate. This is THE sure-fire method for making sure writing doesn’t happen. It’s self-explanatory. Acquire this skill if you lack it. I have some of the items on this list down-pat. I have too much to do; my to-do list is never done. I get up early and stay up late. I’m always tired. Oh, and I DO have the spiritual gift of procrastination. I know there are things I need to change so I can stop writing; I need to sell the business but that event alone, should it occur, would still provide writing fodder. We should have never started it in the first place. It’s made life way too interesting. I either need to put the kids up for adoption or hunker down for the years to come but, darn it, I have grandkids. Maybe I should just become a hermit. But then boredom might be a issue. Bored people look for something to do and the mind might wander to then thought may occur that I could write about where my mind wandered. Then there’s the food…darn it, I love food. I love cooking food and eating food. I’m in such a quandary! This writing thing is a pesky problem. Any suggestions are appreciated. This time-consuming addiction has got to stop. My name is Michelle and I haven’t blogged since…. October 16, 2013. This one doesn’t count, right? Simple but brilliant ideas that make me feel stupid that I didn’t think of them. I found this on accident but the original site had ucky stuff on it so I didn’t just want to send y’all there. SO, I’m posting it. Sue me. (original site is credited below). But’s these are GREAT ideas. I’m finally getting around to a Tips Tuesday post and I can’t even take credit for it. Lame. Worth sharing, nevertheless. Ham, sweet mayo, fixins and swiss cheese. Avocado, pepper, spinach, sprouts Veggie please. The TBLT is what a bunch of peeps are fed. 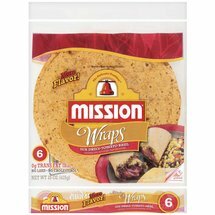 The Salsa Ranch Chicken Wrap is quickly gaining fame. We think it most amazing – we really have no shame. 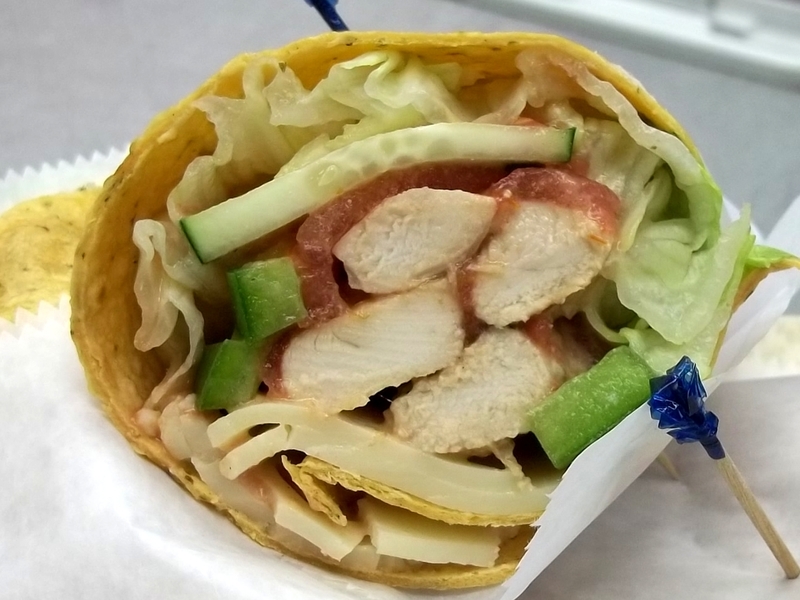 Because our wraps are the bomb, I really must confide. Okay, I know, that is pretty lame. We made a boatload of wraps this week so I was feeling inspired. 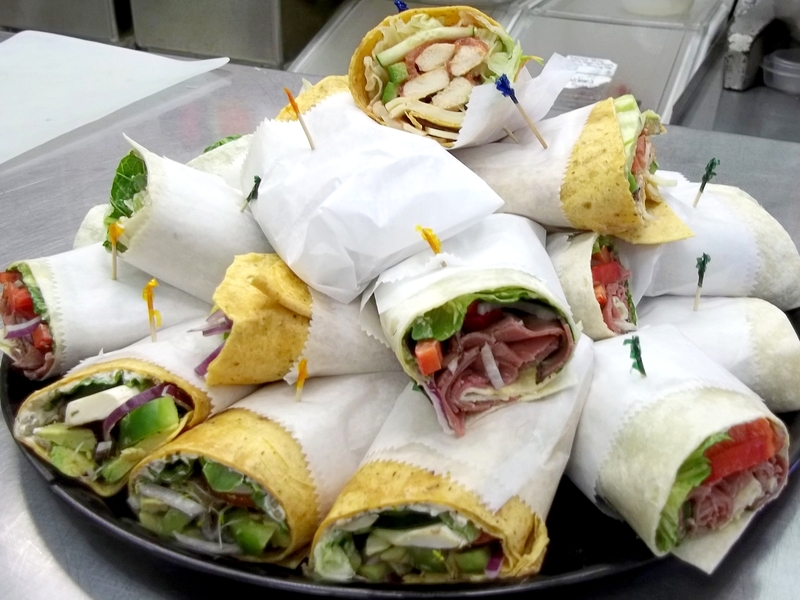 Fechers’ Panache has been pretty uneventful as of late but we were blessed with two days of corporate box lunch orders, Thursday at Wayne Dairy and today at Reid Hospital Oncology, and we made A LOT of wraps. (Did I mention that already?) We also had some croissant sandwiches thrown in the mix today, our Chicken Salad and Apple Tuna Salad, but wraps are, by far our most popular sandwich. Mix well. Never use regular mayonnaise again. Another often-neglected tip some folks do think of is using a panini grill for your wrap! Oh. Yum. It’s worth taking the 10 minutes it takes to preheat your grill and heat til hot and crispy. No panini grill? Preheat 2 skillets, place wrap in larger skillet then put smaller, preheated skillet on top. Voila! Panini grill. I would have thought that with the popularity of fajitas, heating up sandwich wraps was a given but we’ve had several customers impressed with our skill with the panini grill (don’t make me start rappin’ again). One more wrap need-to-know: tortillas come in flavors. This is a news flash for some folks. 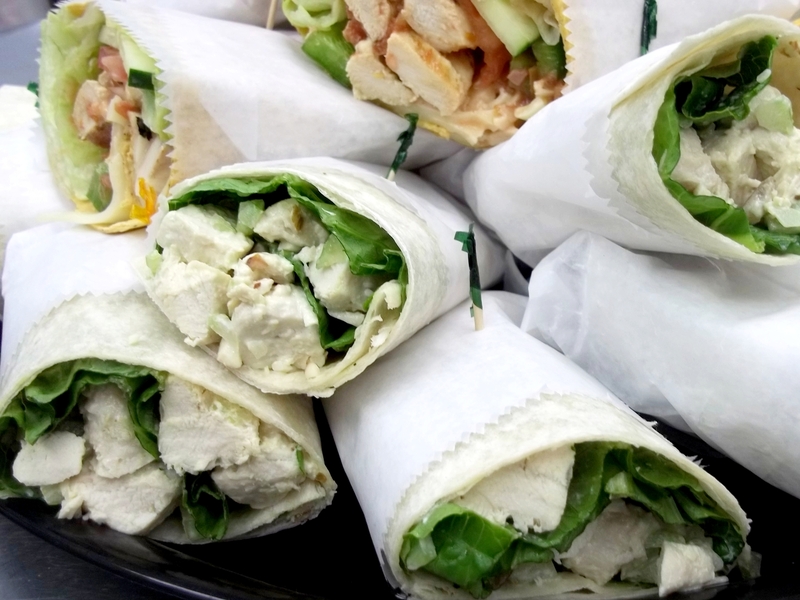 Our Salsa Ranch Chicken Wraps are made with the Tomato Basil Tortillas and aren’t the same without them. 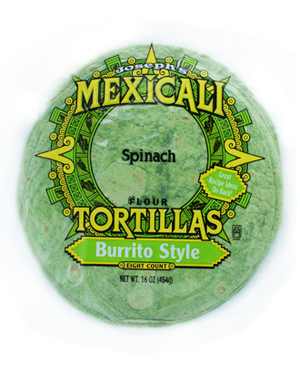 Veggie Wraps taste great in Spinach tortillas as does that fabulous Spinach Artichoke Dip spread on a Spinach Tortilla, wrapped and toasted on the panini grill. Someone make me one – now. The flavored tortillas work great with those pinwheels, too. 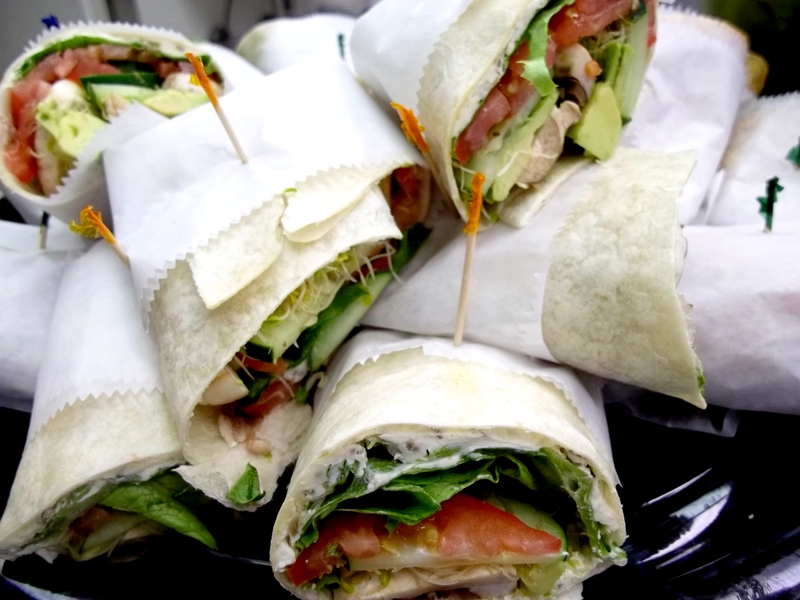 Let me know what your favorite Sandwich Wrap is. We’re always looking for new ideas to try! Everybody showed up for church today. It was a packed house and it was so nice that the weather allowed us to open windows to welcome the breeze and rain cooled the air. When that many peeps pack a house, it can get mighty warm mighty fast. But today was pleasant and folks hung out later than usual. The small fries were able to run amuck outside and the older set played Ultimate Frisbee and some basketball. The dessert table included Pumpkin Rolls, Pumpkin Pie with Homemade Whipped Cream, and we made Pumpkin Crunch. The singing is always great and, though I’m dead tired and kept trying to fall asleep, there was a teaching time that was anointed. I was also blessed simply by the conversation shared among sisters. Very convicting. I was reminded of how a wife has the power to turn a perfectly decent husband into a monster, a lame husband into a worse one, or a monster into a perfectly decent husband. That’s another blog post. Today’s biggest focus, besides Christ, of course, was the imminent departure of our friends from South Africa. Walter, Elaine, Janna, Nadia, and little François. They have spent the past year with us as dear friends and members of our church. For most of the past year, Lenae took Autumn and Isabelle to the our friends’ home each Monday to give a ballet lesson to help them learn English, have friends their own age and, of course, learn ballet basics. Lenae used what she has learned from working at Dance Techniques and it was fun to watch her put together lesson plans for them and talk about how each lesson went. There were days they stayed longer so the girls could play. The friendships made between the girls and the bond that Lenae developed with Elaine were precious to watch. We’re already talking about sending Lenae to visit in South Africa after we can save up enough money. It’s been fun learning about the differences as well as similarities in our cultures. What’s been especially enjoyable has been sharing the love of cooking with Elaine. She’s a fabulous cook and always goes over the top. We’re likeminded in the importance of presentation and experimenting. When we asked her what her likes and dislikes of American cuisine are, she said she likes it all. If she weren’t moving back, we would put her to work at our shop. She said if she were staying, she would love to. Man, I wish we had opened earlier! Elaine and I also like to laugh. We enjoy good humor and good jokes. Her joy is contagious and I’m going to miss having that around. If laughter is good medicine, I’m a healthier person because of Elaine. As it usually goes, I regret I didn’t take the time to get to know her better earlier in the year. So, this week, our friends will be heading back home on an 18 hour flight with little kids (pray for them!) and they have so many mixed emotions. They’ve missed their family and friends and country but will miss being here. My emotions aren’t mixed at all. I’ve already had the tears fall a few times the past week (and tonight) and I would love it if all of their family just moved here. But, since that can’t happen, we’re already having serious discussions about saving for a trip to South Africa, preferably around New Year’s because they have this way-awesome international fireworks competition at Cape Town! Who knew? Until then, thank God for internet. I’m gonna have to learn to use Skype.